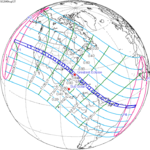 A total solar eclipse will occur on September 3, 2081. A solar eclipse occurs when the Moon passes between Earth and the Sun, thereby totally or partly obscuring the image of the Sun for a viewer on Earth. A total solar eclipse occurs when the Moon's apparent diameter is larger than the Sun's, blocking all direct sunlight, turning day into darkness. Totality occurs in a narrow path across Earth's surface, with the partial solar eclipse visible over a surrounding region thousands of kilometres wide. 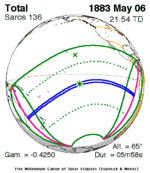 Solar Saros 136, repeating every 18 years, 11 days, contains 71 events. 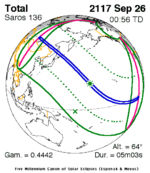 The series started with partial solar eclipse on June 14, 1360, and reached a first annular eclipse on September 8, 1504. It was a hybrid event from November 22, 1612, through January 17, 1703, and total eclipses from January 27, 1721 through May 13, 2496. The series ends at member 71 as a partial eclipse on July 30, 2622, with the entire series lasting 1262 years. 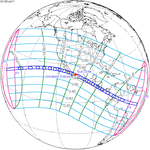 The longest eclipse occurred on June 20, 1955, with a maximum duration of totality at 7 minutes, 8 seconds. 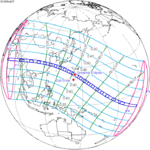 Wikimedia Commons has media related to Solar eclipse of 2081 September 3. This page was last edited on 8 August 2017, at 23:06 (UTC).